This image is named “The death of Obi Wan Kenobi” it’s inspired by the death scene in Star Wars Episode IV. 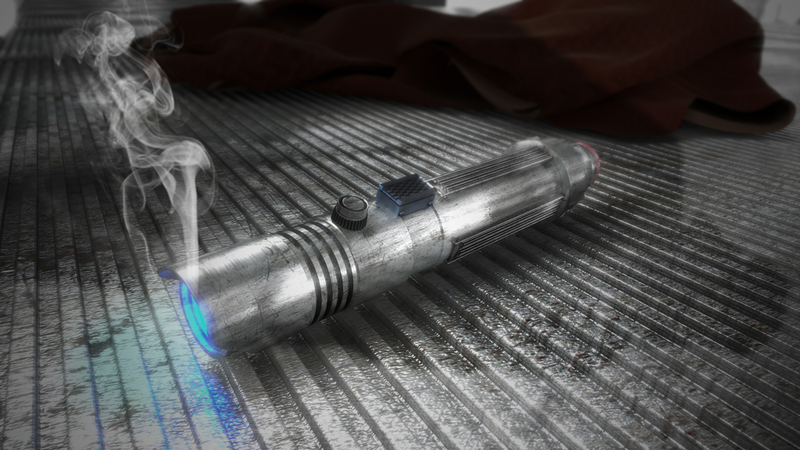 The Idea was to create a keyscene of Star Wars but my problem was iam not a character designer so i came up with the idea of a just used lightsaber on the ground with the cloak of Obi Wan Kenobi in the background and the shadow of Darth Vader on the ground. 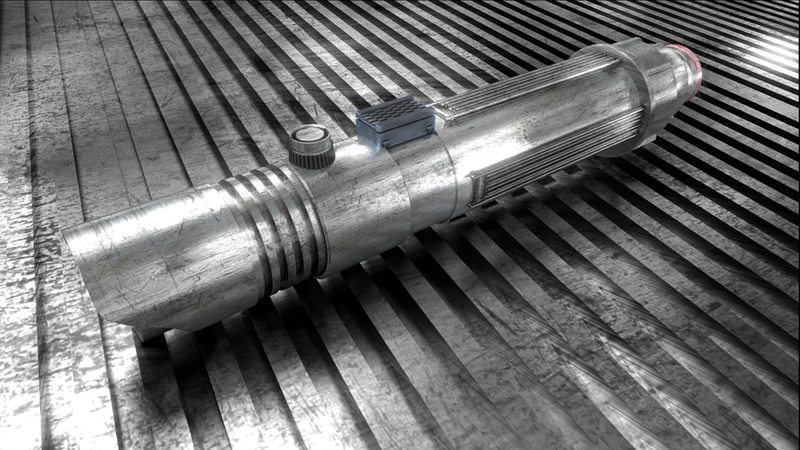 But first i had to model the Lightsaber, its was a task to find a good reference but then I found the site of Roland Palotai RO-Lightsaber. I was blown away by the amazing handcrafted Lightsabers.This site is really worth a look and a paradise for all Star Wars fans. After the modeling I UV unwrapped the whole model piece by piece. Then i created the normal maps with ndo2 by Quixel. The textures are some textures from CGTextures but alternated in Adobe Photoshop. I posted my first attempt into the Facebook Blender Community. After posting i have got some really good critique and suggestion to make the image better. After doing a few test I made the first proof of concept. Getting closer to the final image. The composition looked good but the smoke and the shadow of Darth Vader was to strong and the texture of the cloak was not good enough to call it final. Even the lighting was not right. So i followed a suggestion from a member of the Facebook Blender group to lower the HDR lighting and using 3 kinds of lamps. 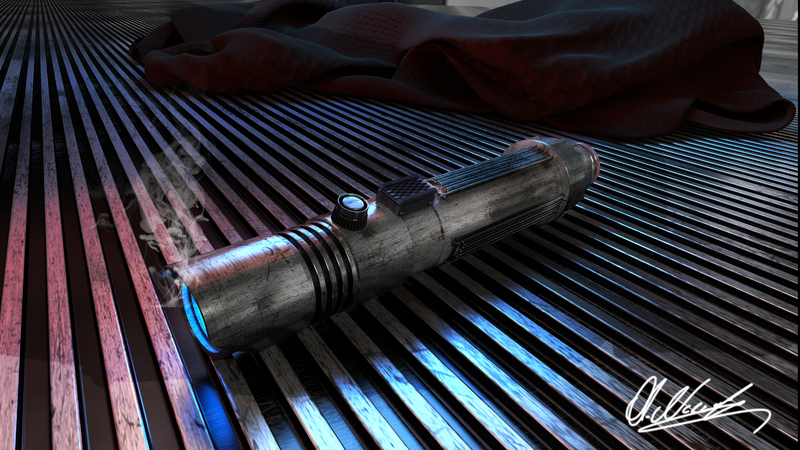 A red lamp to get Darth Vaders red lightsaber into the game a Spot lamp to lit the saber from the front and a blue mesh lamp from above to have a contrast color to the red lamp. The image above is what Blender has given to me without using the compositor. The rest of the work was done in Photoshop. The smoke was added with a smoke brush. For the shadow of Darth Vader i painted a black silutette of Darth Vader bended it and putted it on the ground with a very low opacity to give just the idea of the shadow so that the shadow isn’t dominating the scene. Then i added a color ramp to darken the upper part of the image. For the help and the critique i have to say thanks to the Blender Community out there.